If you are a cheese lover who tries to put shredded cheese on pretty much any kind of dish that you eat, you might want to get a good rotary cheese grater. Once you buy one of these, you will never go back to conventional cheese graters again. They just make the life of a cheese lover a lot easier. No more spending hours just grating the cheese you need for your sandwiches, soups and pasta. We checked out the market for the best rotary cheese graters that are durable, easy to use and produces the best results. Make sure you read until the end of this article to know what you should get. So, what exactly is the difference between a rotary cheese grater and a conventional cheese grater? As you know, a conventional cheese grater is a kitchen tool where one side has sharp-toothed metal and the other side is completely flat. A conventional cheese grater would have you grind the cheese against the surface with the sharp-toothed metals so that shredded cheese would get off from the other side. A conventional cheese grater is truly a practical piece that can be quite useful in the kitchen. You can use it not just for grating cheese but for grating other vegetables as well such as carrots, ginger and even garlic. But the benefits of a conventional cheese grater are trumped by the efficiency of a rotary cheese grater. A rotary ﻿﻿grater is a kind of cheese grater that usually comes with a sharp-toothed drum that can be rotated using a handle. As you rotate the drum, you press the cheese onto it to get perfectly shredded cheese. So why should you get a rotary cheese grater? It can actually offer plenty of benefits. Here are a couple of the highlights of using a rotary cheese grater instead of a conventional one. One great thing about using rotary cheese graters is that you will be able to get perfectly shredded cheese within mere seconds. 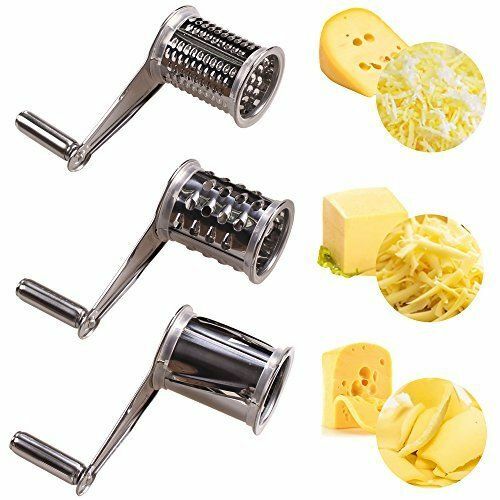 Unlike conventional cheese graters that require you to rub the cheese against the grater, a rotary cheese grater shreds the cheese as you turn the handle. The rotary cheese grater allows you to perform a swift motion that can generate lots of shredded cheese without having to exert a lot of effort. What I like about rotary cheese graters is that they are less messy to use. You can grate the softest of cheeses with a rotary grater and your hands would get those little cheese bits sticking to your fingers as you do so. Another great thing about rotary cheese graters is that you can point it directly on top of a bowl or a dish and the shredded cheese would beautifully fall into place. It’s just a whole lot easier to direct the shredded cheese with a rotary grater. One of the best things about using a rotary cheese grater is its versatility. A rotary cheese grater makes it easy to shred hard cheeses, chocolates, and even nuts. If you’re feeling creative, you can even try shredding other kinds of hard ingredients with it. Here are a couple of factors that I would like to remind you to consider before you go and get a rotary cheese grater. Being aware of these following factors will help you become one happy and satisfied customer. Although the shredders that often come with rotary cheese graters are made of metal, other parts of the cheese grater can be made with other materials such as plastic. Try to choose a rotary cheese grater that is made with high quality materials that do not easily break, especially when placed under pressure. I suggest going with a nice stainless steel rotary cheese grater to ensure that the handles won’t break off when you are shredding hard ingredients such as nuts. However, this doesn’t mean that plastic rotary cheese graters are a bad choice. Plastic rotary cheese graters can be easier to maintain since plastic isn’t corrosive. They can also be easier to maneuver since they are lighter than the metal ones. Rotary cheese graters come in different shapes and sizes. Some rotary cheese graters even come with stands so that you can prop them up on your counter as you shred your ingredients. Before you get a rotary cheese grater, just make sure that you go with one that will be able to fit your available storage space. 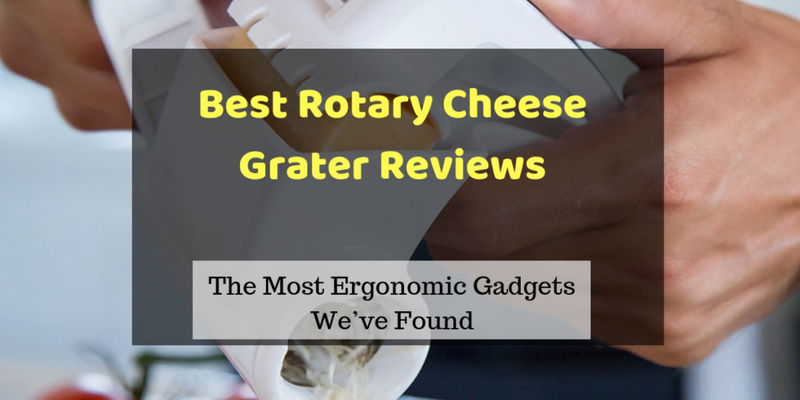 One important factor that you should never forget when it comes to choosing rotary cheese graters is the ergonomics. Try to go with a rotary cheese grater that comes with a comfortable grip. Also try to choose a cheese grater that comes with handles that will be easy to turn. Making sure that your rotary cheese grater comes with an ergonomic design will not only prevent awkward usage but hand pains as well. This factor would, of course, depend on how much cheese you plan to shred with your grater. I suggest going with a medium capacity rotary cheese grater so that you wouldn’t have to put in chunks of cheese constantly if you need to shred a large amount of cheese. You can check out our reviews of each product below. 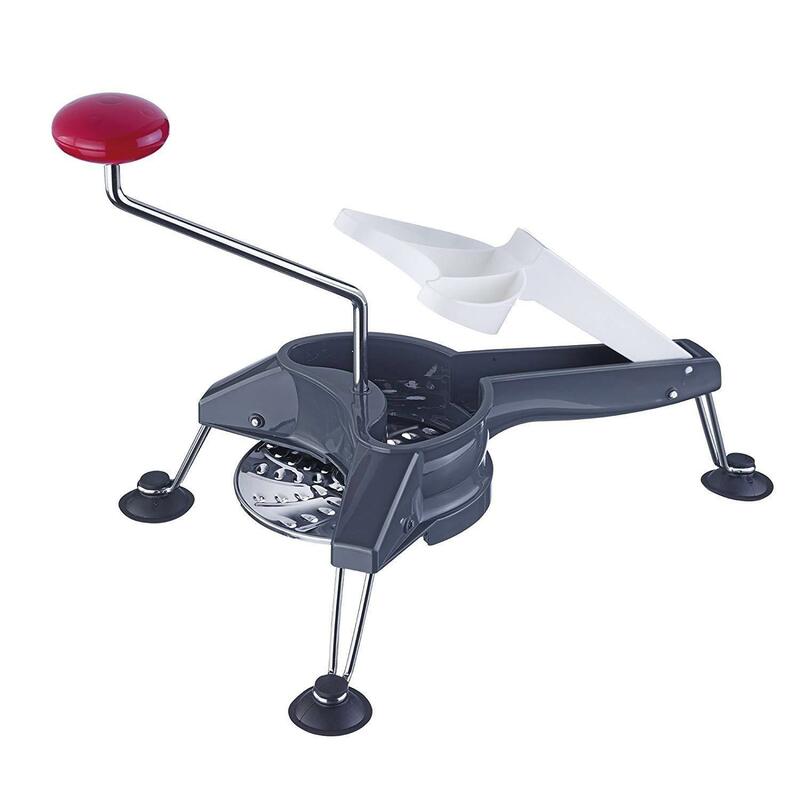 This rotary cheese grater from LOVKITCHEN is a truly versatile piece of equipment since it comes with 3 rotary drums that you can use to produce different sizes of shredded ingredients. 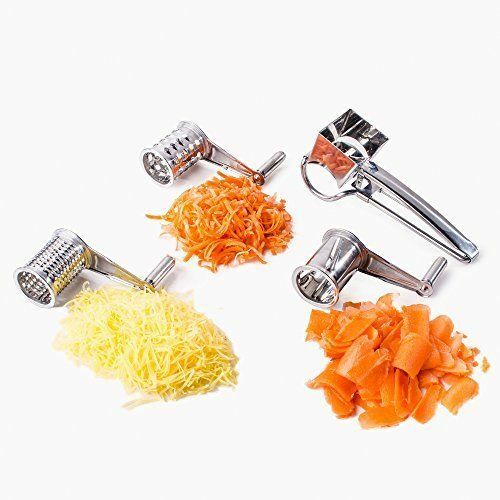 Each cylinder blade that this rotary cheese grater comes with is made with highly durable stainless steel that will allow you to efficiently grate even the hardest of ingredients such as parmesan cheese, frozen chocolate bars, and nuts. What’s great about this product is that it’s simple and easy to use. 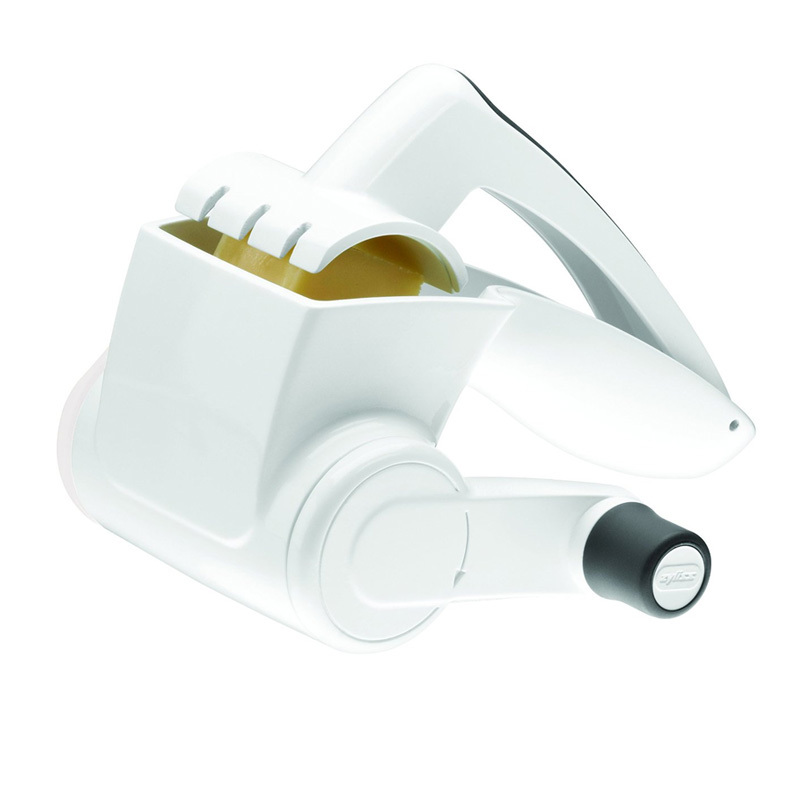 All you have to do is place your ingredients inside the hopper and turn the handle to start shredding. To release the cheese from the cylinders, just give it a slight tap and the shredded cheese should fall onto your plate. Another great thing about this product is that it comes with an attractive and compact design. It isn’t as large as other rotary cheese graters, but it has enough space to accommodate medium-sized cuts of cheese. Lastly, this product is also quite easy to clean and maintain. You can clean it up after use using your dishwasher without having to worry if it will get damaged. The vendor of this product also provides great after-market service that you can rely on if any issues ever arise. The Zyliss rotary cheese grater is probably one of the most practical rotary cheese graters in the market today. I say this because unlike other rotary cheese graters, this one has no extra parts, and it serves one purpose, which is to shred or grate ingredients. What’s great about this classic rotary cheese grater is that it comes with a fine metal drum that once turned, can efficiently and effectively shred all sorts of ingredients such as hard cheeses, nuts, and frozen chocolates. Another interesting feature of this rotary cheese grater is that it is designed for ambidextrous use. This means that whether you are left-handed or right-handed, using this product won’t be much of a hassle since its handle can be attached to either side of the drum. Another great feature of this rotary cheese grater is that it's made with materials that meet the very strict standards that the NSF states. It is completely NSF restaurant certified, a very important factor if you plan to use this for commercial purposes. Lastly, this rotary cheese grater is also quite easy to clean and maintain. It comes with plastic parts, except for the cylinder, that do not rust or gain molds. It’s also completely dishwasher safe and it comes with removable parts for easy washing and drying. This ALISKID rotary cheese grater is a highly durable product because it is made with high-quality stainless steel. If you accidentally drop this thing on the floor, you wouldn’t have to worry that it will break or dent. What’s great about this product is that it comes with 3 different cylinders that you can easily interchange if you wish to achieve different coarseness levels. Each of the cylinders are also made to be really sharp and durable so that it can be used for shredding all kinds of ingredients, even hard ones like parmesan cheese, nuts, and chocolates. Another great thing about this rotary cheese grater is that it is supported by a lifetime warranty. So, if any issues ever occur, you can always seek help from the manufacturer. They even offer 24 hours of accommodating service. Another simple and practical rotary cheese grater from this list is the IKEA Stralande rotary grater. What makes it so practical is its overall build. With this rotary cheese grater at your disposal, you won’t have to worry about complicated assembly. It comes with a simple and very understandable design that will allow you to use it right out of the box. Another great thing about this product is that it is designed to make turning the handle comfortable and extremely usable for both left-handed and right-handed people. It’s one of the most underrated features of a rotary cheese grater. What’s more is that this product can easily be assembled and disassembled. You don’t even have to check the instructions that it comes with. What’s great about easily removable parts is that you can have an easier time cleaning the whole thing as well. This product is also completely dishwasher-safe. Because of that, it is quite easy to maintain since you won’t have to exert much effort into removing food residue that can cause corrosion and mold-buildups. This rotary cheese grater from Westmark is probably one of the most durable rotary cheese graters in this list. This cheese grater falls under the Westmark brand, a German brand that has made a name for itself in the culinary industry for the heavy-duty products it constantly produces. What makes this rotary cheese grater extremely durable is its high-quality stainless steel build. 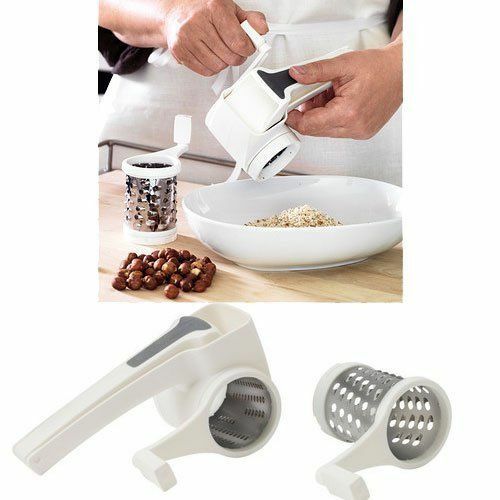 Whether you are shredding almonds, pistachios, peanuts, parmesan cheese, or other hard ingredients, this rotary cheese grater will certainly help you shred your ingredients with comfort and ease. What’s interesting about this cheese grater is that it comes with an ABS base and handle that just adds to its overall ergonomic design. Just prop it up on your counter and start turning the handle to get large amounts of shredded ingredients. You won’t even feel tired after using it for quite some time because you no longer need to carry the whole thing over your plate. Another great thing about this rotary cheese grater is that it comes with 3 different disks that you can use to achieve different coarseness of shreds. It has a disk for coarse shreds, fine shreds, and sliced shreds. This makes it ideal for slicing fruits and vegetables such as carrots, tomatoes, and cucumbers. We've chosen the Lovkitchen as our best rotary cheese grater due to its versatility, ease of use and dishwasher safety - it's a great pick! The LOVKITCHEN Rotary Cheese Grater is an easy contraption to use, perfect for new cooks or those who just want to save their hands from getting hurt by the traditional grater. The price is affordable, and it offers different coarseness levels of grated ingredients, great even for more serious cooks. The Zyliss Classic Rotary Cheese Grater is a versatile piece that is also perfect for left-handed people. Left-handed people might have a hard time using the traditional rotary cheese graters, which is why this would be an ideal option as it is not picky when it comes to which hands to use. The Aliskid Stainless Steel Cheese Grater is one of the most durable graters around, perfect for those who want to invest in the best kitchen tools or for those more serious home cooks who are conscious about the tools they are using. This won’t disappoint you. For smaller grating needs, the Ikea Stralande Rotary Grater should suffice. It has straightforward functions and is easy to maintain as well since it can be cleaned using your dishwasher. If you are looking for a cheese grater that can also double as a slicer for your vegetables, get the Westmark Multipurpose Heavy Duty Rotary Cheese Grater. It’s a versatile kitchen tool that will surely be used heavily in your cooking arsenal. All these products are good, so no matter what you choose, you should be able to get the most out of them. We also urge you to check out our homepage to find more product recommendations as well as reviews that can help you find the best tools for your kitchen.